Create a Hyperlink or Link directly in Google Sites using the WYSIWYG menu bar. when creating a link, Google Sites provides various options to link existing page / image/ search for pages/recently edited pages , link to an external website or a Google Apps Script. Google Sites - HTML Links support the Authorisation Schema / Rich Snippet Markups: rel="author"/ rel="publisher" and rel="me". Use the rel="nofollow" for external Links on your Google Site . It can also be combined with the Authorization Markup rel="me nofollow". Do NOT link directly to Google Plus/Twitter or Facebook etc.. from your Homepage/ Main webpage . Google Sites Creates an Additional href attribute for the link tag,along with the other attributes. 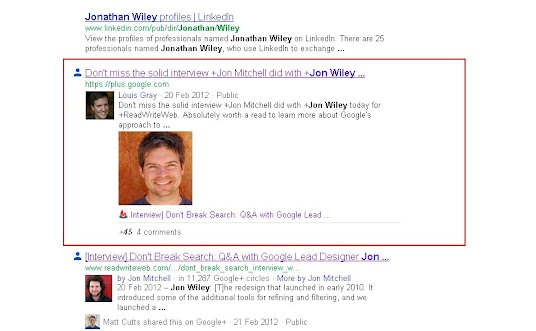 Google Plus Profile Photo -on the Left-hand side of a Google Search Result - Rich Snippet . More recently used attributes include rel="author" for social networking and Rich Snippets in search engine results. Verify your Email in Google Plus. Their are full public/privacy/Circles options. There are several different types of Rich Snippet. For a particular page you would like to show Google Plus Rich Snippet. Include the following rel="author" attribute in a link to your Google Sites contact or about webpage. Then, Use rel="me" to link to your Google Plus page from your Google Sites contact or about webpage. How the Rich Snippet look in SERP [Search engine Results Pages]. 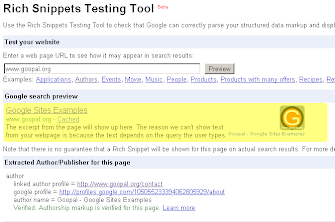 Once you have tested your Rich Snippet is visible with the Testing tool above.